WASHINGTON (NNPA) – Over the course of a 32-year teaching career, Jacqueline James noticed a glaring problem— Black History was slowly but surely being ignored in the schools where she worked. When it was outright dropped from her required curricula, she got creative, using Black history calendar factoids for penmanship lessons. Now retired, she’s on a quest to re-educate the nation’s Black children. 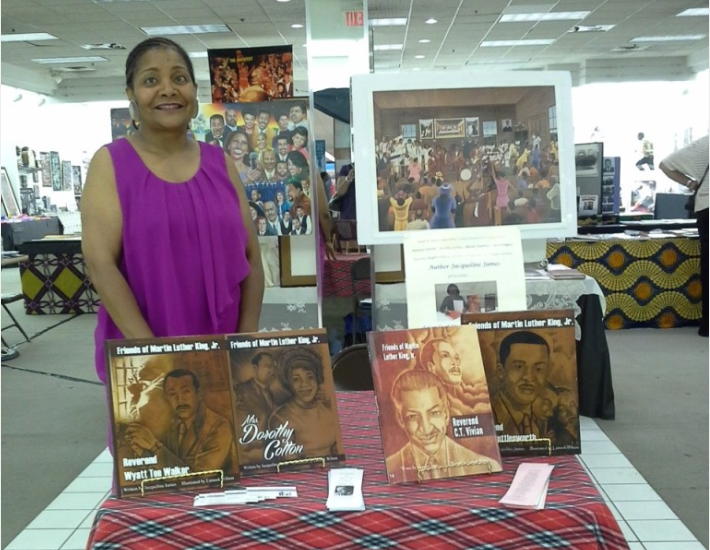 In 2009, she founded JAX Publications to write, self-publish, and market a children’s historical non- fiction series of books, called Friends of Martin Luther King, Jr. The sepia-toned hardcovers feature key players in the Civil Rights Movement who supported and worked with Dr. King. They are written at a middle school level, and each book has accompanying lesson plans and enrichment activities for teachers. James’ lesson plans are also in line with the Department of Education’s Common Core educational standards, which have been adopted by almost every state. And she’s enriching her own life, too. Through her company, JAX Publications, James is able to avoid the steep percentage cuts of being carried in a bookstore, which typically takes 40 percent, or working with a publisher who might want to own the rights to her work. But more importantly, the project allows the self professed “historical-accuracy fanatic” to get up-close and personal with the figures she so admires. Take C. T. Vivian, the subject of the first book in the series, for example. “When I was 17…I saw this man standing, talking to this White racist sheriff. He wouldn’t stop talking, and the [sheriff] hit him and knocked him down. And then he got right back up and kept talking. They picked him up and took him to jail,” she remembers. Forty years after that, James was a guest at an event to commemorate the 40th anniversary of the Selma-to-Montgomery, Ala. march and Rev. Vivian was also in attendance. Since then, she’s become acquainted with other civil rights luminaries such as Dorothy Cotton, Rev. Fred Shuttlesworth, and many more (even becoming good friends with the latter’s daughter, Ruby Shuttlesworth Bester). A few months after that conversation, Shuttlesworth began having strokes. And a few years after that, his wife called to ask James to rush-deliver his book in the series. A few hours after reading the un-illustrated, unpublished manuscript, Shuttlesworth died at home. James says that if she hadn’t been the kind of voracious reader who has read the newspaper cover-to-cover since grade school, she might have never known about these key figures. In fact, when she first met Shuttlesworth at an awards ceremony, she had no knowledge of who he was or the contributions he had made until he gave his keynote address. There was also the time a librarian friend had invited her to an author event featuring Richie Jean Sherrod Jackson, author of The House on the Side of the Road: The Selma Civil Rights Movement. Unbeknownst to James at the time, the home of Jackson and her husband, Dr. Sullivan Jackson, served as the safe house and headquarters for all civil rights activity in Selma, Ala. President Lyndon B. Johnson was even known to call there looking for Dr. King and others. The more James learned as she taught, the more she realized how little Black history was being shared across generations. For example, she recalls learning that Dr. King’s “Letter from Birmingham Jail” had been written on smuggled scraps of paper over time, and that his friend Wyatt T. Walker not only reassembled it later, but had also smuggled in the camera that captured the iconic photos of his imprisonment. Even in her own childhood, James, now 66, remembers not knowing much about the history taking place around her. Today, the Friends of Martin Luther King, Jr. series consists of 28 titles, including A. Philip Randolph, Bayard Rustin, Dorothy Height, and more. Her books can be found in Georgia’s DeKalb County Library system; in a few schools in Michigan, DeKalb County, Atlanta, and Durham, N.C. and can also be purchased directly from her website, www.jaxpublications.com. In addition to adding to the series, she’s also seeking financial partners to launch a children’s magazine, and dipping her toes in publishing other like-minded authors’ works.